Reasons for single-tooth gaps are manifold and involve deep carious lesions, failing endodontic treatment [Figure 1], progressive periodontal disease with subsequent tooth loosening, hypodontia (congenitally missing teeth) and trauma. 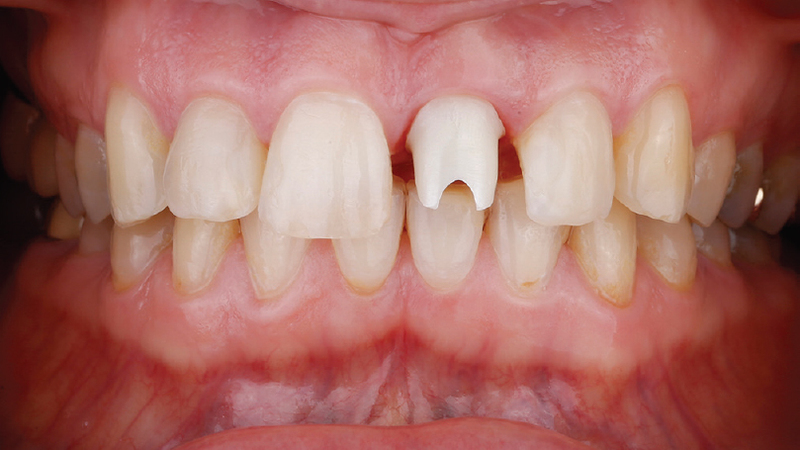 Injury-related tooth loss, in particular, occurs predominantly in the anterior region of the upper jaw; however, tooth gaps in the aesthetic zone are of exceptionally high relevance for patients  compared to missing teeth in the posterior parts of the mouth. Most patients, therefore, strongly wish for a quick prosthetic restoration to be able to go on with their everyday social life. 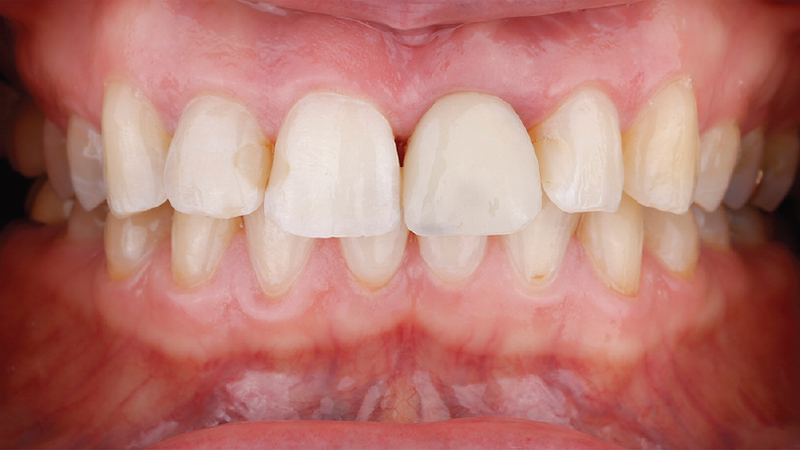 Treatment options to restore single-tooth gaps include removable partial dentures (naturally not favoured due to disturbing coverage of parts of the palate as well as the negative effects of clasps that retain the prosthesis), fixed bridges on the neighbouring teeth (associated with the inherent downside of damage to the natural teeth in the course of bridgework preparation) and the placement of dental implants. Titanium implants are the preferred choice for single-tooth rehabilitation as they replace the root of the missing tooth, and thus, no additional load is transferred to the remaining dentition. Compared to fixed bridges (that anchor the artificial tooth crown on the neighbouring teeth), single-tooth implants do not cause damage to the adjacent teeth and are particularly recommended when the natural teeth are healthy and have not yet had large fillings or root canal treatment. Removable partial dentures, on the other hand, are increasingly going out of fashion, and young patients, in particular, are aiming to avoid prostheses as long as somehow possible. The major advantages of immediate implant placement at the time of tooth extraction are the reduction of surgical interventions and the possibility of immediate fixed restoration  to avoid removable provisionals. Immediate insertion of dental implants at the time of tooth extraction is a safe and predictable procedure if the tooth socket has not been damaged by major inflammation or severe trauma. In case of acute purulent inflammatory processes or large cysts, a healing period after tooth removal must be respected; however, chronic inflammation does not pose a contraindication to simultaneous extraction and implant placement. General conditions that contradict dental implants involve a history of jaw radiation or chemotherapy, severe osteoporosis, uncontrolled diabetes, as well as on-going periodontal disease and bad oral hygiene. According to the digital workflow developed at the Academy for Oral Implantology, the first optical scan is performed intraorally even before tooth removal [Figure 2]. 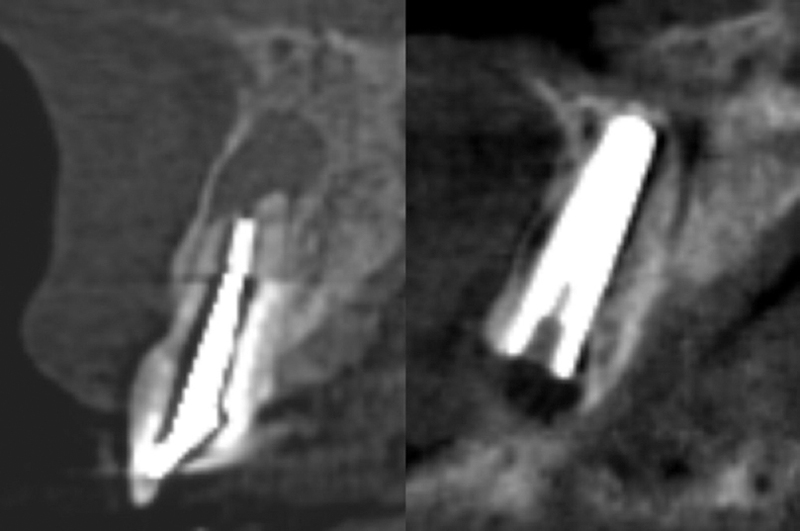 By this means, the initial soft-tissue situation is captured and the three-dimensional (3D) planning of the implant position [Figure 3] can be performed on pre-operative cone-beam computed tomographic scans. Correct 3D positioning is considered crucial for a successful aesthetic outcome as deviations of only 0.8 mm can significantly compromise the aesthetic result. Under local anaesthesia, the failing tooth is extracted very carefully using special equipment to preserve the surrounding bone. In the majority of cases, the bony walls of the tooth socket are kept intact, and the inflammatory tissue can be removed. 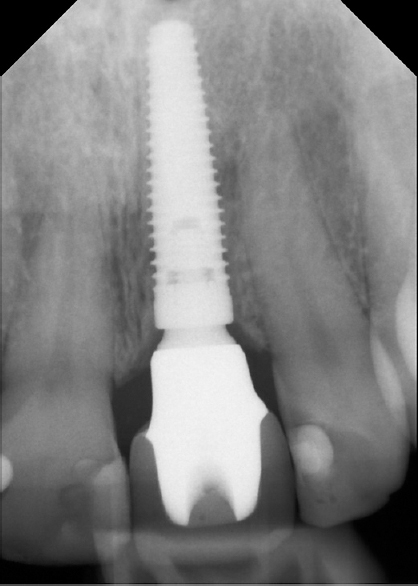 As the implant is inserted through the opening of the socket, no soft-tissue incision or sutures are required. The implant preparation is performed in an approximately 30° angle to the tooth axis to anchor the implant in the healthy bone towards the palatal or lingual side of the tooth socket. Thus, a primary implant stability of 35 Ncm or more can be reached that facilitates the immediate restoration of the new implant via provisional crowns. Swelling and pain during as well as after immediate implant surgery have proven to be minimal compared to conventional surgical techniques. Painkillers are routinely administered; however, patients report that they need medication for no longer than 2 days or even shorter. Prophylactic antibiotic medication is prescribed as a one-shot therapy at the day of surgery only. Immediately after implant placement, a second optical scan is performed to record the exact implant position in the mouth, and the digital data are sent to the Dental Laboratory. 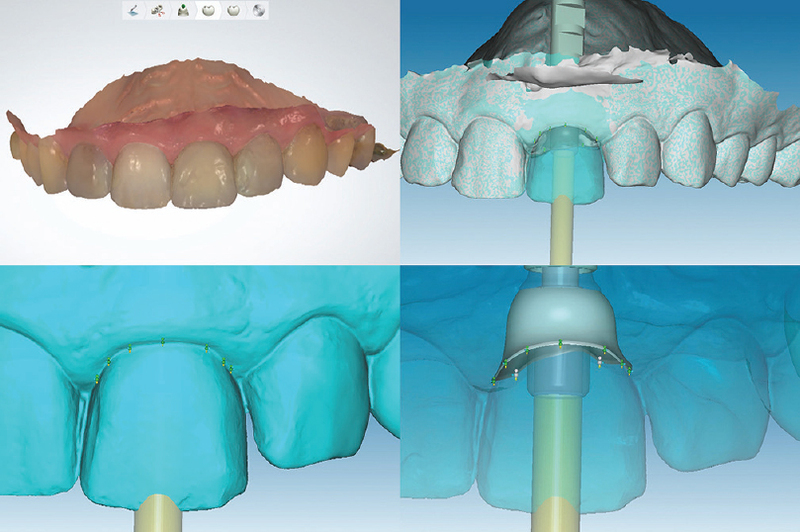 The fabrication of zirconia ceramic abutments is initiated instantly after computer-aided design using the optical scan of the preoperative soft-tissue situation as a reference. The success of the Copy-abutment technique relies on the exact replication of the 3D anatomy of the natural tooth to be replaced. For this reason, no standardised implant components are used as each patient situation calls for an individualised ceramic abutment that perfectly supports the peri-implant soft tissues and thus guaranteed satisfactory aesthetic results. 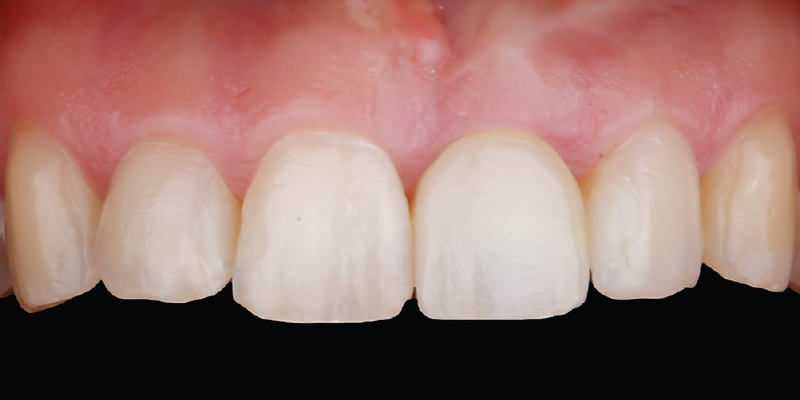 Owing to the fast digital workflow and the computer-aided manufacturing using ceramic milling machines, the final zirconia abutment can be manufactured within a few hours and is screwed on the implant on the day of surgery already. Thereafter, the Copy-abutment is never removed from the implant body again so that bone loss and soft-tissue recession associated with multiple abutment changes are circumvented. The provisional crown is administered just a few hours after tooth removal so that there is no need for removable provisional dentures during the entire treatment course [Figure 1], [Figure 2], [Figure 3], [Figure 4], [Figure 5], [Figure 6], [Figure 7], [Figure 8], [Figure 9]. The Academy for Oral Implantology was founded in 2004 in Vienna, Austria, and has treated over 15,000 patients ever since. Patient records were kept of each of the 25,000 dental implants placed. Following the immediate implant concept and Copy-abutment technique, we record 10-year implant success rates of 97%, minimal peri-implant bone remodelling of <1 mm and imperceptible soft-tissue recession of 0.5 mm, on average. These results are documented by over 100 scientific publication in international peer-review journals by our team. 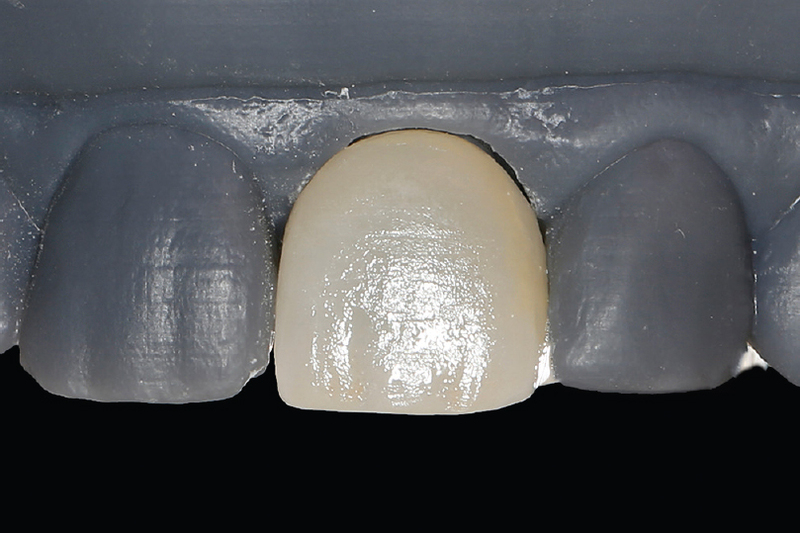 After a healing period of at least 3 months, the final all-ceramic crown is attached to the implant [Figure 8]. Compared to other therapeutic approaches, the immediate implant concept carries the big advantage of significantly shortening the treatment duration; however, the major benefit is the preservation of peri-implant soft tissues due to the optimised support from the 1st day after tooth extraction on. The Copy-abutment technique thus obviated the need for invasive soft-tissue augmentation procedures and renders a perfect aesthetic outcome with just one surgical intervention possible. Pommer B, Krainhöfner M, Watzek G, Tepper G, Dintsios CM. Relevance of variations in the opposing dentition for the functionality of fixed and removable partial dentures: A systematic review. Int J Dent 2012;2012:876023. Monje A, Pommer B. The concept of platform switching to preserve peri-implant bone level: Assessment of methodologic quality of systematic reviews. 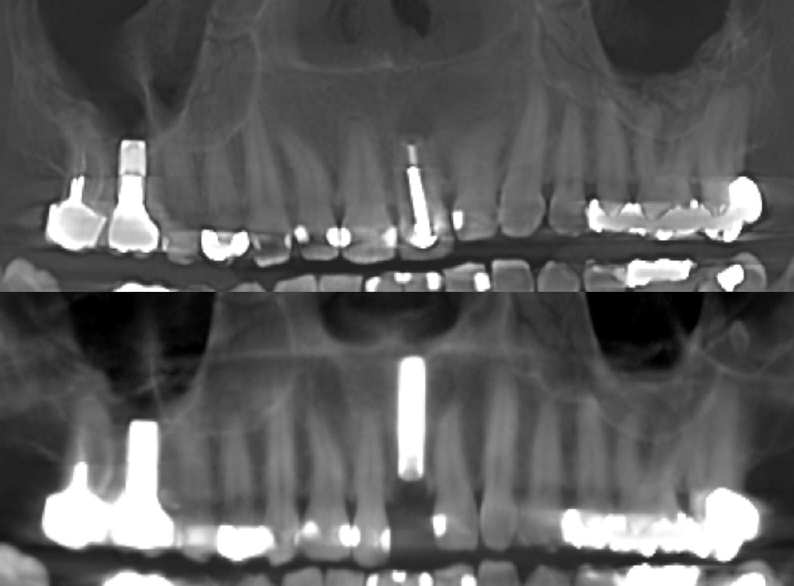 Int J Oral Maxillofac Implants 2015;30:1084-92.